I’ve come to appreciate ice more than ever. I fully realize it’s very much a first-world problem that I just spent a year and four months at a rental property with a refrigerator that didn’t have an ice maker. I didn’t even think to check the refrigerator for one when we first looked at the place. But, it’s made me value my new ice maker all the more. My brand new refrigerator makes cute, little cubes, and it even came with a handy scoop to transfer those cubes to glasses or cocktail shakers. I learned the hard way that cocktail making is a completely different game when you don’t have ice being made automatically in your refrigerator. When I received a review copy of Bitterman's Field Guide to Bitters and Amari , I was excited both to learn about the topic and to get back into the swing of making cocktails. The book does a very good job of explaining what bitters are and their history. Bitters are classified as “non-potable” flavoring agents which means that although they are made with and contain alcohol, they’re not sold as an alcoholic beverage. It’s assumed they won’t be consumed in quantity. Amari are similar in flavor but are considered “potable” and might be served as drinks. The primary flavor of both is bitterness of course, but beyond that there’s a wide spectrum of aromas and flavors to explore. There’s a description of how different commercial bitters are made and recipes for making your own. I was interested to learn that the infusing step when flavoring agents are left in the solvent, or tincturing, only requires about four or five days. Next, there are cocktail recipes for using both homemade and commercial bitters, and many flavors and brands are suggested. Following the drinks, there are recipes for cooking with bitters and ideas for balancing flavors in interesting ways. Last, you’ll find a comprehensive list of specific brands and flavors with tasting notes to get an idea of the intensity of aromas and flavors of what’s available. 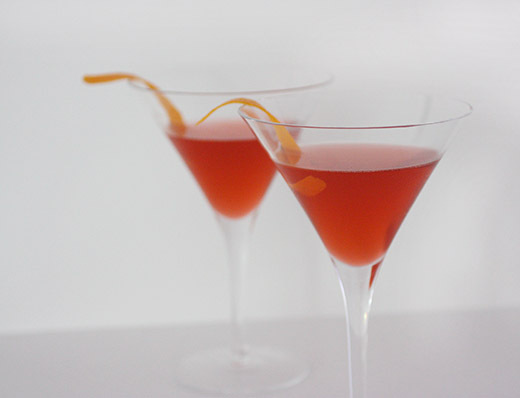 It was Valentine’s weekend, so I started with a red cocktail, the Embittered Negroni. 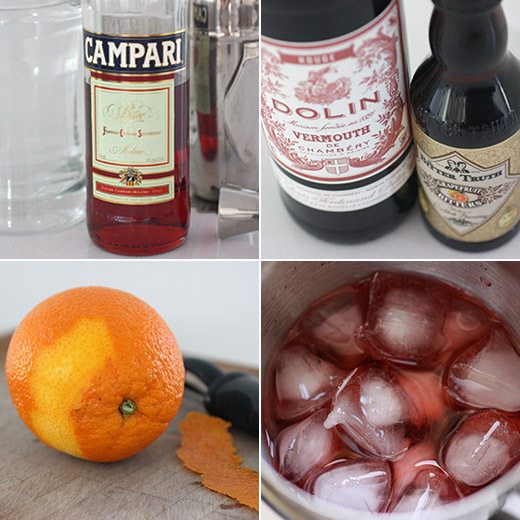 For this version, rather than mixing equal parts gin, sweet vermouth, and Campari, there’s more gin than sweet ingredients and some added bitters. I took the book with me when I headed off in search of bitters since it is a “field guide.” Fee Brothers bitters are easy to locate and they’re reasonably priced. However, that info in the book about how bitters are made revealed that this brand relies on a glycerin base and artificial flavors and colors. Something to keep in mind when cooking with bitters is that the alcohol base will quickly evaporate and take some aromas and flavors with it. Flavors from bitters with a glycerin base will remain even when exposed to heat. But, either way, it’s best to add them at the end of cooking. With all of that in mind, I chose The Bitter Truth brand grapefruit bitters which is made with an alcohol base and is highly aromatic. It was added with gin, Campari, sweet vermouth, and ice in a cocktail shaker and stirred. I poured the cocktails into chilled martini glasses and garnished with orange twists. I liked this less-sweet Negroni, and I really liked the world of flavors to discover in these bottles of bitters. I also tried the recipe in the book for a vinaigrette with grapefruit bitters. It pointed up the flavors and sharpened it like nothing else could have. There are endless new possibilities with cooking and cocktail making now. With a selection of bitters and ice at the ready, who knows what I could mix up next. Recipe reprinted with publisher’s permission from Bitterman's Field Guide to Bitters and Amari by Mark Bitterman/Andrews McMeel Publishing. 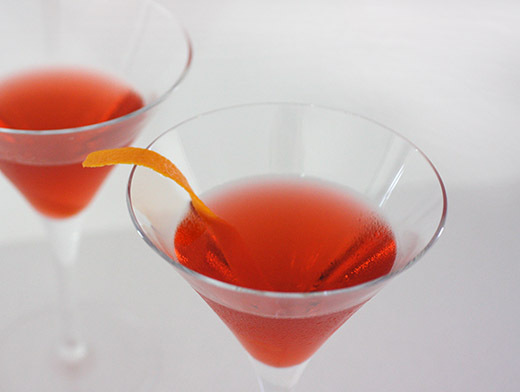 Mythology has it that the Negroni sprung like Athena from the head of Count Camillo Negroni in 1919. The no-nonsense count, who found himself in need of something stiffer than an Americano (Campari, sweet red vermouth, and seltzer) asked the kind bartender, Fosco Scarselli, to swap gin for the seltzer, and this gave birth to a cocktail so freakishly delicious it must surely have rumbled Mount Olympus. Tradition has us mix equal parts gin, sweet red vermouth, and Campari. Begging the count’s permission, I lengthen the gin and crop the sweeter ingredients, then throw a bitter bolt of lightning through it to really light things up. The result would have made dear Camillo a god, or at least a marquis. 1. Pour all the ingredients except the orange twist over ice in a chilled mixing glass. 2. Stir and strain into a martini glass. 3. Garnish with the orange twist. A wonderful cocktail and fantastic combo! Your new kitchen sounds fantastic! And so does this lush Negroni! This is a perfect week end treat. Thanks for explaining the difference between bitters, Lisa...Sounds like a gem of a book and yes, so does that cocktail! i fear that this would taste too much like alcohol and too little like sugar for me to like it. :) i love the color though! Love, love, love Negronis. Recently tried a white Negroni made with Cocchi Americano and dry vermouth. Much more delicate on the palate, but still refreshingly bitter. Oooh, I haven't tried a white negroni. I need to! Can't live without an ice maker! Although we sometimes make ice for cocktails (those big blocks where 1 cube fills a rocks glass). Love the Negroni -- such a great drink. Really informative post -- thanks! Hi Lisa, what a beautiful drink, I don't think I've ever had one of these. Great explanation on bitters. Take care! Not having an ice maker would be pretty awful! This cocktail looks refreshing, pretty, and tasty. what is it with rentals and ice machines? My fridge has one, but it wasn't working for 2 weeks. Finally, they replaced the fridge as the part they needed was no longer made. Seemed a tad drastic to me, but I now have ice! Gotta give them credit for that! Would love to try this drink, have all the ingredients too. My most favorite gin is St. George's...terroir. Totally divine, but might be a tad herbal for the negroni. Beautiful photo, Lisa. Yes, I'm in and settled. Thanks to my lovely daughter, who worked like a trooper with me.